One of the first pieces I published this year was also my favorite (and for one of my favorite outlets): the story of an inspiring housing cooperative in western Turkey. 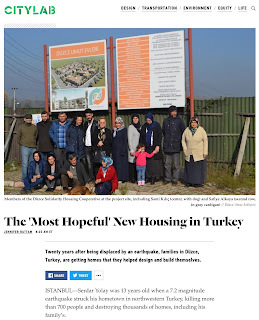 I learned about the Düzce Hope Homes while reporting a big piece on political urbanism in 2017 and spent a rainy day in January at the construction site with members of the community, who sent me off on my bus trip back to Istanbul laden with jars of their homemade yogurt and preserves. Twenty years after being displaced by an earthquake, families in Düzce, Turkey, are getting homes that they helped design and build themselves. It's far too easy to waste all day on Twitter, but I wouldn't have published this piece without the social-media platform: spotting a call for pitches in a tweet led to my first story for Hyperallergic, and my first on performance art.